A new suite of office software applications (freewae) was added in 2012, a new name to keep in mind, is: Kingsoft Office 2012 Suite Free. b. graphical interface of the three applications familiar to those who already uses Microsoft software (version XP/2003). c. ability to convert a file directly to PDF. The number of pages are totally the same, which means the page margin, line spacing, character spacing, picture and all the content in the document are displayed according to the same parameters. When we tried to open the same document with other word processors, like OpenOffice.org Writer, the number of pages changed to 184. In this respect we can clearly see that different word processors usually apply different layout standard. 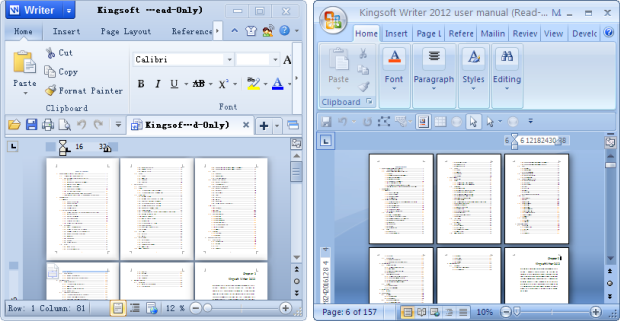 However, Kingsoft Writer keeps the same with MS Word. Similar with Spreadsheets / Presentation, when we open *.xls / *.xlsx / *.ppt / *.pptx files created with Microsoft Excel / PowerPoint with corresponding Kingsoft programs, the layout and functions are successfully inherited and displayed. Conclusion: By installing Kingsoft Office, when you send or receive documents, you don't need to worry about file compatibility and layout issues. You can open Microsoft Office documents with Kingsoft Office, and others can open your documents created with Kingsoft Office with their MS Office. The following is a list of updates for Kingsoft Office Suite. The list order is from the latest version to the initial version. Each version description includes the version number, release date and the update details. Note: Features with * marks are only available in Professional and Standard Editions. 7. Support recording recently used font list, memory task pane settings and memory to display or hide the function area feature. 6. * Optimized the bubble pop-up mechanism when click "upgrade online" from the "Help" menu before the serial number is expired. 5. In the pie chart, the percentage cannot be accurate to decimal places, now this problem has been solved. I was extremely impressed by the product's compatibility with Word and Excel files. In particular I found that can properly handle some VBA macro that does not work on OpenOffice / LibreOffice. For those who want access to a more professional version (, here is where to find a table comparing the various versions of the product. Only add that in the paid version you can edit and modify VBA macros and you can choose whether to use the new Ribbon interface (similar to Microsoft Office 2010). NOW, you can see also: "2013: Kingsoft Office Free / Professional"